Su ccess has a thousand parents, failure is an orphan. That the 2018 USS dispute transformed UCU everyone in the union accepts. Similarly, it was the members – their enthusiasm and determination, and their knowledge that USS was a touchstone of the wider political problems arising from the gung ho tuition fee market in HE – that lead this transformation. However, while no serious analysis of UCU’s historic strike dissents from these conclusions, there is less understanding of how this transformation was built in advance. The movement did not spontaneously erupt. It required leadership, perspective and organisation. What was the role of leadership in UCU that created the circumstances for this transformation? “Leadership” is often a multifaceted and ambiguous concept, referring to official individual national leaders and those rank and file collectives within branches whose names and contribution are all too often ignored and forgotten. The latter are always the most important in the creation of a new transformative movement, but the role played by the former can – and in the USS case did – play a crucial role in the emergence of the movement prior to the rank and file gaining influence. Similarly, while social media played a key mobilising and representation role once the dispute was up and running, social media was not a key feature in the origins of the strike. Again the role of rank and file activists at branch level needs to be emphasised. Thus, while the most successful and influential social media platform USS Briefs began after the strike started, providing an important forum for critical discussion over the ideological questions determining the pension scheme valuation, day-to-day mobilisations arose from rank and file initiatives, and were championed by the existing rank and file network of UCU Left activists. As the strike developed, of course the doors opened and we saw networks and groups explode into action, from #NoCapitulation, #OurUCU and Branch Solidarity Network. Yet “leadership” in the sense of a national leadership also played a crucially important role in the construction and development of the strike. The ballot for strike action was successful because of the role of activists, in UCU Left although often not under some ‘party banner’, carrying out a systematic agitational, educational and ideological campaign before, during and after the ballot. Most of this was in the many dozens of talks and meetings organised by branches in which UCU Left USS negotiators spoke. But other examples include UCU Left NEC member Sean Wallis’ Made in Westminster piece for the HE Convention website, which first spelled out a perspective that is now universally accepted: that the origins of USS’s self-appointed ‘crisis’ lay in the war-of-all-against-all that is the HE marketplace, triggered, of course, by changes in Government Policy. UCU Left consciously connected with activists amongst a much broader layer of the union in order to mobilise the membership for industrial action. But crucial to understanding this process was the central role played by UCU Left in acting as a catalyst around the attacks on the USS pension scheme. UCU Left members were negotiators, UCU Left NEC members and UCU Left branch activists who challenged the pessimism of those on the Right of the union. The Right’s views were and are characterised by a fatalism over their inability to prevent changes to the pension scheme and their rejection of industrial action as a mechanism for the mobilisation of the membership. The politics of the Right can best be described as a kind of “partnership unionism”. This assumes that employers are prepared to genuinely negotiate, consult and change their mind even as they wield an axe over pay, jobs and pensions. Yet every activist in every university realises that such a perspective is frankly naive in the context of Higher Education marketisation and an assault on our members’ rights. Unless we mobilise our members to resist, our rights are forfeit. 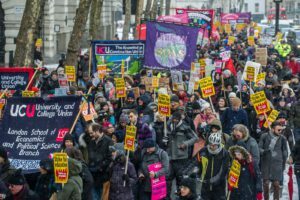 UCU Left members had to develop an industrial action strategy that not only unified members but could provide the plausible route to win an industrial dispute of magnitude required to prevent the destruction of a UK wide pension scheme whilst challenging the hitherto dominant right wing’s approach. In order to win the union to a proposal for serious escalating and sustained industrial action required an ideological argument within UCU among activists at Congress and branches which rejected the bureaucratically-controlled, tokenistic, and low-level industrial action which had been characteristic of previous UCU strikes. UCU Left members had to alert members early on about the risks to the pension scheme and in a piecemeal manner deconstruct the employers and USS political justification for a deficit. ‘No Detriment’ and Made in Westminster reflected a culmination of a series of earlier debates linking the attempted deconstruction of a pension scheme to a political destruction of a public, collective higher education system and its replacement with a marketised, individualised, debt funded provision of services for fee-paying customers. This was not easy. UCU Left members faced an onslaught of criticism aimed at undermining the chance to win a ballot and had to patiently but relentlessly challenge these right wing criticisms. Some of the most disgraceful troll-like behaviours of some on the Right were evident on union email lists and at every stage of the debate. ‘Inevitability’ and ‘unaffordability’ was the position posed by those who rejected industrial action as a means to defend the scheme. The divisions between the Right who control the union, and the Left who represented rank and file activists in branches, in the union started to reveal itself for the first time to wide layers of members in the union. The divisions between the left and the right in the union did not end once a successful ballot vote was won. Instead these divisions were also reflected and intensified in the strike movement. While the strike is rightly remembered by those who took part with affection as a jubilant, inspirational time of their lives, it also proved to be stressful, as a rank and file leadership emerged struggling to challenge moves to undermine the strike! This was most evident in the two national meetings of branch delegates, the first of which on March 13 threw out the ACAS agreement, and the second on March 21, when the majority of the elected HEC leadership ignored the delegate’s meeting discussion and voted by ten to eight with one abstention to call off the action, and put the proposal for a Joint Expert Panel (JEP) to the membership. At that second delegates meeting, #ReviseandResubmit was the activists’ will, not because proposals for a JEP were a “sellout”, but because the initiative driving a settlement came from the picket line. Wide layers of activists recognised that continuing the strike for any further length of time would have forced employers to collapse for fear of students being unable to take final exams. But the Right on the HEC blinked first. HEC’s decision to ignore delegates’ views rescued employers from a humilating defeat and propelled the anger of branches into the UCU Congress. The bureaucratic manipulation of that Congress in May 2018 then laid out starkly the difference between the left and right in the union. Where does this assessment leave us? Abstention in these debates is not an option. These debates are at the heart of our ‘member-led union’. When a key decision has to be made in our union, we need a leadership in our union capable of taking hard decisions and backing the membership in action. UCU Left members on the HEC agreed to vote together in a disciplined manner throughout the dispute, but in particular at the most significant HEC in the USS strike’s history: to continue with the industrial action and #ReviseandResubmit the proposal for a JEP rather than end our dispute and cross our collective fingers. Just as the Right agreed to vote on bloc to halt the strike, a leadership willing to stand up for members is necessary to build a democractic, member-led union. The vote at the specially-convened 21 March HEC (10 for ending the strikes, 8 against and 1 abstention) is illustrative of the balance of political forces in the national leadership of our union. Without an organised Left, willing to discuss positions, come to a collective view and vote accordingly to implement it, the dominance of the Right would have not simply ended the USS strike but would have prevented it in the first place. Indeed, to Sally Hunt’s credit it was she who leaned on the Right of the HEC to make it clear she wanted the strikes to take place, pressuring them into voting for hard-hitting industrial action and opposing any watering down of the union’s demands on the employers. Of course, later on she was personally involved in negotiating the JEP and ending the dispute, but her initial intervention in favour of action should not be forgotten. What the union needs is clear and consistent leadership not a vacillating bureaucracy. Voting for Jo McNeill in the election for Vice President is not just about voting for an individual. It is about voting for a different strategy than that offered by the trade union bureaucracy and its supporters, and a rank and file leadership that fights to take action in order to win. UCU Left members are activists who have openly declared their position for action, and crucially to coordinate to win key votes to ensure action goes ahead. This vote for Jo is a key vote for the democratic, member-led voices in UCU. Without activists such as Jo the USS strike would not have taken place.